Exceptional service, a truly exclusive ambience, a near-private beach, an incredible setting and gorgeous interiors—these are the criteria a property has to fulfil to be inducted in Tatler 10's Best Southeast Asian Beach Resorts. Here are our top picks of beach resorts situated within the region that's closest to home, Southeast Asia. Chic tropical resorts are aplenty in this region, but few serve up an experiential and visual feast like Four Seasons Langkawi. This 91-room hideaway may already be seven years old, but its Alhambra Palace-inspired design with Moorish details in a bucolic Malay kampong setting makes it one of the most unique properties this side of the Andaman Sea. Its ravishing never-ending private beachfront, backdrop of jungles and mountains, and location within the UNESCO World Geopark (with sites dating back 550 million years) allow guests many ways to commune with nature – lie on the sand and watch sea eagles soar; sail or windsurf; go on a cable car ride to MatCincang peak; marvel at sea creatures in Pulau Payar Marine Park; scoop squid from a fishing boat and more. While its pavilions are the lower room category, they are spacious and boast private balconies or decks. The residential-style villas are sprawling and come with private pools. Another plus: The resort does family-friendly luxury very well, and offers year-round kids programmes. Don’t worry about noise or claustrophobia though – its four-hectare grounds has enough space for everyone, and there is also an adults-only quiet pool. Situated on Naka Yai Island off the northeastern side of Phuket, this spanking new Luxury Collection Resort & Spa property is only 25 minutes from Phuket airport (including a 5-minute private speedboat ride) and yet feels worlds away. Formerly a favourite haunt of sea gypsies and local fishermen, guests can now enjoy what the Thais have kept a secret for so long – breathtaking views of Phang Nga Bay (where James Bond Island is), an idyllic natural environment and ultimate solitude. Rustic, however, The Naka Island is not. Arrive in style at this stylish 67-villa resort in a BMW 7 Series saloon and expect to be floored with the refinement and luxury inside its huge 450-square-metre villas: large plunge pools, sala pavilions, open-air bathrooms, high-tech entertainment systems and a comprehensive music library. It’s not just the setting that will inspire inner peace in you, but also the immaculately kept grounds, the calm and crystal-clear waters off its sandy beaches, Spa Naka’s array of herbal treatments, and the soothing amblence of the Bai Cha Chinese Tea Room. A nice touch is the bicycles provided for guests to ride around on. Once the Alcatraz of IndoChina, the former penal colony and island archipelago of Con Dao in southern Vietnam is now attracting willing inmates thanks to its breathtaking, untouched shores protected for decades as a national and marine park. Another massive factor in the region’s growing appeal is the new Six Senses Con Dao resort on Con Son Island, which is remote but easily accessible via daily 45-minute flights from Ho Chi Minh City. The latest outpost of the environmentally aware luxury chain, which opened early 2011, is fulfilling its remit in style. The resort’s 50 villas are built with the lightest ecological footprint directly onto a perfect crescent of golden sand extending between two rugged promontories, and yet represent the ultimate in style-mag chic with cool stone floors, rattan blinds and high-tech gizmos. Such attendant extras as private butler service, an amply stocked wine cellar, and tailor-made in-villa banquets for two nudge the experience from prime luxury to supreme decadence. If you are feeling energetic, the resort can organise anything from kayaking to scuba diving, while lotus-eaters can luxuriate by their own private infinity pool. Owned by a Singaporean, The Racha has been a regular favourite with our fellow countrymen familiar with Phuket. Situated on the small Racha Island off the southern end of Phuket, the 85-villa environmentally-responsible property is just a 35-minute speedboat ride from Chalong Bay and boasts one of Phuket area’s best beach locations. Granted, all beaches in Phuket are public by law, and daily day-trippers do visit and enjoy Batok Beach fronting the resort from the late morning until mid-afternoon, especially during high season. But that proves one thing – the beauty of this slice of paradise and the captivating Andaman Sea views from here. When the tourists have cleared out, guests will feel they have the whole island, which does not have towns or paved roads, all to themselves. There are yoga sessions, walks, snorkelling, diving, kayaking and ATV rides to choose from. Also noteworthy is how luxuriously chic the ambience of the whitewashed villas are. The ultimate has to be The Lighthouse, featuring two master bedrooms and two single rooms over four floors, a private pool with underwater music, jacuzzis and a high-tech entertainment and gaming system. Currently the first and only Ritz-Carlton Reserve property, the two-year-old Phulay Bay is still spoken of in superlatives. It was conceived to offer a six-star experience in a naturally stunning yet secluded location – and this boutique hideaway in Krabi delivers on all fronts. 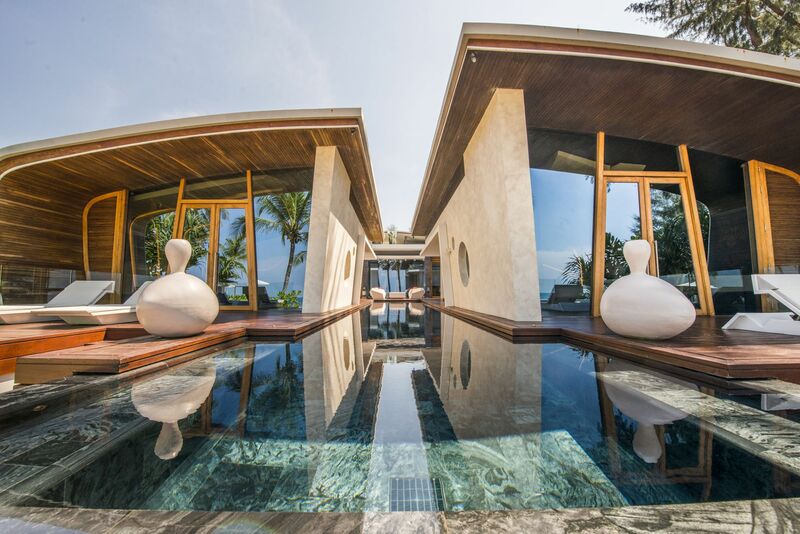 Situated within a national forest along a coastline flecked with more than 200 islands and dramatic limestone karsts, the resort serves up lavish holidaying within a setting that boasts contemporary Thai styling and sustainable construction. Each of its 54 one-bedroom pavilions and villas are cocoons of ultimate comfort, featuring four-metre-long beds, large indoor baths, spacious walk-in wardrobes and verandas appointed with loungers and picturesque views of the Andaman Sea. Villa guests are pampered with outdoor baths and private plunge pools. With an emphasis on bespoke tailor-made experiences, Phulay Bay will fulfil your every (reasonable) wish, whether it is a full-day of holistic massages and treatments at the Espa, a special menu for a special occasion, or even elephant trekking to a remote picnic spot. Should you need to lift a finger, it would be to call your dedicated butler. You know something’s up when the first phase offering of a resort development sells out within two months. It is called Song Saa, the first private island resort in Cambodia that also managed the melding of barefoot luxury with sustainability – in the untouched Koh Rong archipelago 30 minutes by speedboat from coastal town Sihanoukville. Opened late last year, it spans Koh Ouen and Koh Bong islands connected by a footbridge. They form part of a larger marine reserve established by the property. The smaller three-hectare island houses 27 over-water, beach and jungle villas featuring original design ideas by owner-creative director Melita Hunter. A highlight there is the over-water restaurant and lounge offering fabulous contemporary and Khmer cuisine, as well as spectacular seascape views. The bigger island serves as a sanctuary for flora and fauna including hornbills, owls, sea eagles and rare orchids. The focus on conservation also extends to the nearby Koh Rong island, where the resort has started community engagement programmes ranging from water quality to farming. Its all-inclusive room rate policy means a Song Saa vacation is as stress-free and enjoyable as it can get. The recent opening of Anantara’s first Vietnamese resort on the idyllic, sand dune-encrusted coastline of Mui Ne, a four-hour drive northeast of Ho Chi Minh City, marks the birth of this little-known slice of paradise as a luxury beach destination. Scattered along the pristine and impossibly long stretches of sandy shores here are a handful of modest local resorts, so Anantara quite easily steals the spotlight with its great location, stunning design and luxurious accommodation. The resort features 89 rooms, suites and villas – each of which comes dressed in traditional Vietnamese decor and boasts spacious living spaces and bathrooms with outdoor showers and large stone soak tubs. Complimenting the guestrooms are five excellent f&b outlets and jaw-dropping views of not just the South China Sea, but of the nearby White Lake, home to legendary 30kg carp. Just beyond the resort are a golf course, scenic rivers, ruins of the ancient Champa kingdom and the Ta Cu mountain. With a perenially sunny and breezy climate hovering between 28°C to 30°C, it is little wonder that Vietnamese have kept Mui Ne a secret for so long. Many of you would already be familiar with the party beaches of Boracay and the touristy Cebu. If you’re a traveller who desires privacy and does not need to trawl night markets or clubs, Eskaya has the perfect getaway for you. Located on Panglao Island, the resort flaunts 15 charming thatched Filipino-style villas across 16 hectares of landscaped grounds, so you’re as far away from the crowds as possible. While only 600 metres, its private beach overlooking the Bohol Sea boasts powdery white sand and is a great launchpad (on kayak) to other beautiful beaches nearby. There are great reefs in this region, so diving or snorkelling is a must. The resort also offers several interesting packages, which include firefly-watching, an island-hopping sunset cruise, a countryside tour and river cruise, and a visit by paddleboat to a local oyster farm. Otherwise, visit the Handuraw Spa for some me-time or simply while your time away in your villa, which come with its own large whirlpool tubs and (for some villa categories) private pools. And before you leave, do request in advance for a barbecue dinner on the beach by a bonfire. Just as a list of the world’s best beaches would be lacking without the Philippines, a list of top beach resorts would be nary complete without an Aman. Just consider Amanpulo. Occupying the entire 6.5km expanse of a glorious lush is a white-sand island so private, it is only accessible via a private plane (read: tourist flow is controlled). Entrancing views of the cerulean sky and crystal-clear sea of the Pamalican Island, located northeast of Palawan, are the standard; villas, be it a one- or four-bedder, are humungous and embellished with a private pool; casitas give you direct access to the beach via sandy footpaths or take you to Zen mode high in the canopy; flourishing species of marine life are but a few metres from its shores… the list goes on. More recently, the resort started organizing trips for guests via seaplane or helicopter to the Jewelmer Pearl Farm in the municipality of Taytay. There, the history, beauty and cultivation of the treasured South Sea Pearl, the Philippines’ national gem, is explored. One: It has just three villas and a penthouse, all with views of the turquoise Andaman Sea and futuristically designed in a Star Trek meets Santa Monica aesthetic that lends them an air of grandiosity and sensuality all at once. Two: Service is impeccable since you’ll have your own butler, chef, driver, spa therapist and housekeeper meeting your every whim and fancy. Three: There’s a separate “club and hotel” for your kids within the same compound, filled with costume shops, treehouse- and cave-themed bedrooms, play areas, dining spaces and a theatre. Four: Tim Butler of trendy Bangkok restaurant Eat Me and Iniala Group owner Mark Weingard’s collaboration launched Esenzi, a premium seafood restaurant focusing on changing up classic dishes to suit the more modern, more experimental palate. Five: It’s only a 20min drive from Phuket airport. Nuff said.